In 1925, Elmer Anderson started a Ford dealership on the Main Street of Frazee MN. When highway 10 moved off main he followed and switched to selling Chevrolet cars and trucks. By 1935, along with selling Cars and trucks he purchased three buses and began what would be the first of over 80 years of continued passenger transportation service. Working with Ted are 52 great drivers, managers, technicians, and cleaners. 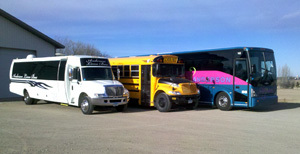 Anderson Bus & Coach operates 24 school buses, 11 motor coaches, 3 small executive seated buses, 1 Hummer H2 limo, and 5 party buses.